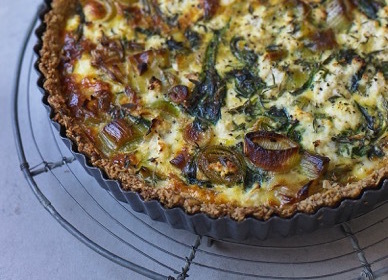 I picked up a copy of Alexandra Dudley’s new book – Land & Sea – this Summer and made this delicious quiche for some friends; it’s the perfect dish to make in advance as the flavours really infuse as it cools. I asked Alexandra to share the love and her top tips for making the ultimate veggie quick. Read on to find out more. 1. Begin by toasting your sunflower seeds. Place them in a dry frying pan over a medium heat and toss them until they are nicely browned and begin to smell nutty (about 5-7 mins). Allow to cool. 2. Place the oats and a good pinch of salt in a food processor and pulse until you have a flour. Add the toasted sunflower seeds and pulse a few times until the seeds resemble a crumb-like coarse flour. Don’t over blend as you want to keep a little texture. 3. Add the chilled butter and pulse until the mixture resembles coarse breadcrumbs. Slowly add the water until the mixture begins to form a rough dough. You may want to transfer it to a bowl and finish using your hands. 4. Shape the dough into a disc and wrap it in cling film, then transfer to the fridge for about an hour. You could also place it in the freezer for 15 minutes. 5. While the dough is chilling, preheat the oven to 190°C/375°F/gas mark 5. Transfer the leeks and 1 tablespoon of butter or coconut oil to the frying pan and cook on a low–medium heat until soft. Add the garlic and continue to stir everything for a minute or so. Add the spinach and cook for a further minute or until it has wilted. Remove the pan from the heat. 6. Take the dough from the fridge or freezer and press it down into the tart shell to an even thickness. Persevere with this, if your tart shell is the correct size there will be enough pastry. Make sure you give your sides strength rather than focusing on a heavy base. Prick the base of the pastry case and bake in the oven for about 10 minutes or until the pastry has dried out a little. Remove and set aside. Reduce the oven temperature to about 170°C/325°F/gas mark 3. 7. In a medium bowl, whisk together the eggs, milk, turmeric, thyme and a pinch of salt and pepper using a fork. Add the leeks and spinach and combine. Add about half the ricotta, breaking it up where you can and loosely stirring it in. If you are using Parmesan, stir it in at this point, too. 8. Pour the mixture into the pastry shell and crumble or spoon over the remaining ricotta and another pinch of salt. Bake for 30–45 minutes or until the middle of the tart has set but has a slight wobble. Remove and leave the quiche to cool completely before serving.